More than half of the 70 million teachers (primary and secondary) in the world’s formal educational system are from the Asia-Pacific region – making it essential to document the current situation for teachers in the region. 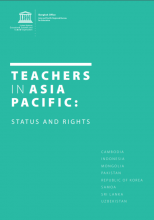 Teachers in Asia Pacific: Status and Rights (2015) examines the trends and policies affecting teachers’ status and their emerging needs and challenges. It provides a general picture of the current situation of teachers in Uzbekistan, Mongolia, Republic of Korea, Samoa, Pakistan, Sri Lanka, Cambodia and Indonesia. Raising the status of teachers and upholding their rights is a critical and global issue. This study reviewed essential elements of the current status and working conditions of teachers, examined the rights and privileges of teachers and developed recommendations for policies and strategies to attract qualified teachers and motivate them to remain in the teaching profession. The key recommendations, which are based on this research, are aimed at improving the status and rights of teachers in each of the countries studies, and in the Asia-Pacific region as a whole. Though country contexts are diverse, this report gives a snapshot of the region and highlights the importance of advancing teachers’ status and providing multiple career progression pathways to motivate them to remain in the profession. What’s included in the recommendations? The results and policy recommendations presented in this report provide insights that are valuable to governments in advancing the status of their teachers with the view of retaining them in the profession. These include recommendations on selection criteria, pre-service teacher education, professional development, career development, salaries, measuring teacher performance, school leadership, teachers’ voices, teachers’ working conditions and gender within the workforce.